and lover of fine fashion... and bread. Liz Neeley is the assistant director at COMPASS where she helps develop and lead the communications trainings for scientists, and specializes in the social media and multimedia components of their workshops and outreach efforts. Before joining COMPASS, Liz studied the evolution and visual systems of tropical reef fishes at Boston University. After grad school, she helped communities and researchers in Fiji and Papua New Guinea connect their knowledge of local coral reefs ecosystems to the media. 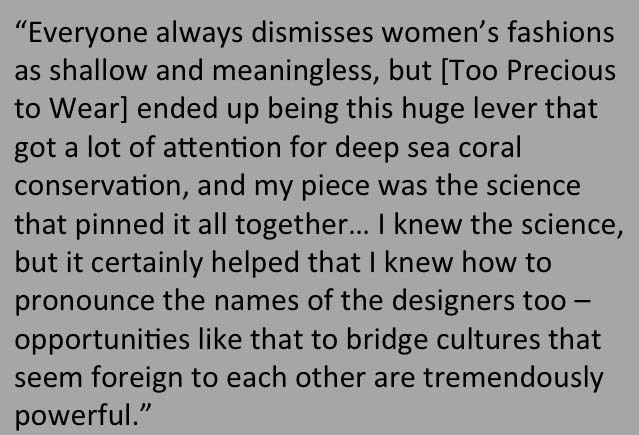 She also dabbled in international science policy while working on trade in deep-sea corals. 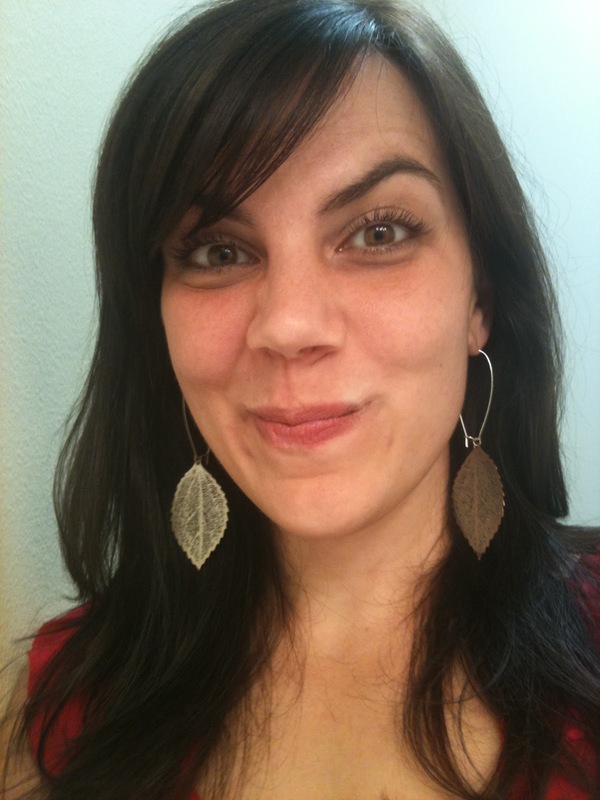 Liz is currently based in Seattle, at the University of Washington. You can find Liz on Twitter (@LizNeeley) and on Google+. Also check our her passion projects, ScienceOnline Seattle and her SciLingual hangout series. DXS: First, can you give us a quick overview of what your scientific background is and your current connection to science? I was one of those kids who knew from a really young age what they wanted to be, and that was a fish biologist. Sea turtles, dolphins - no way - I wanted to study fish. My mom actually found an old picture I drew when I was in third grade about what I wanted to be when I grew up: it was me in a lab coat, holding a clipboard, and tanks of aquaria behind me. You combine this with the fact that I am also a really stubborn person, and I just wanted to do science straight through all my schooling. Not just the coursework either - I did an NSF young scholars program in high school, was the captain of the engineering team, and, of course, was a mathlete. I did my undergraduate work in marine biology at the University of Maryland. I did three years of research there on oyster reef restoration, and then went straight into my PhD at Boston University, where I studied the evolution of color patterns and visual systems in wrasses and parrotfish. I actually did not finish my PhD. 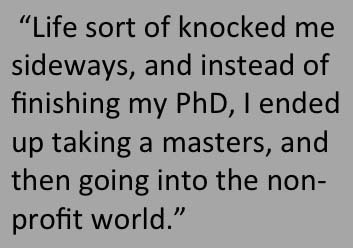 Life sort of knocked me sideways, and instead of finishing my PhD, I ended up taking a masters, and then going into the non-profit world. At first, I mostly worked on coral conservation in Fiji and Papua New Guinea, and I did a big project on deep sea corals. After I left grad school, I started a 20-hour per week internship at an NGO called SeaWeb. Vikki Spruill, who was the founder and president, has killer instincts and a passion for women’s high fashion that I share. She had noticed coral jewelry coming down the runway in Milan, Paris, and NY. People just didn’t have any idea that these pieces of jewelry were actually animals, much less that they were deep sea corals. So we launched a campaign called “Too Precious to Wear,” which partnered with high-end fashion and luxury designer to create alternatives to these deep sea corals – celebrating coral but not actually using it. The Tiffany & Co. Foundation was our major partner, and we got to throw a breakfast at Tiffany’s that brought in fashion editors from Mademoiselle and Vogue. 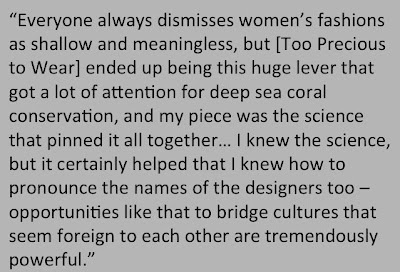 Everyone always dismisses women’s fashions as shallow and meaningless, but this ended up being this huge lever that got a lot of attention for deep sea coral conservation, and my piece was the science that pinned it all together. I got a taste of the international policy component of that as well, and headed to the Netherlands for CITES (the Convention on International Trade in Endangered Species) as part of the work. I knew the science, but certainly helped that I knew how to pronounce the names of the designers too – opportunities like that to bridge cultures that seem foreign to each other are tremendously powerful. I currently work at COMPASS, which is an organization that works at the intersection of science, policy, and communication/media. Our tagline is “helping scientists find their voices and bringing science into the conversation.” For my part, this means, I teach science communications trainings around the country, helping researchers understand how social media works, how reporters find their stories, and how to overcome some of the obstacles that scientists often put in their own way when they talk about their work. What I love about this work so much is that it keeps me in the science community – around people who are pursuing tough questions. That is how my brain works, it is how my soul works, and I want to be a part of it. The power of this for me is to be able to take in all of this knowledge that is generated by these scientists and help connect it to the broader world. I feel like this is the best contribution I can make. I am a pretty artistic person – or at least I think of myself as a pretty artistic person! My creative outlets usually involve some kind of graphic design. I am always giving presentations for my work, and I constantly ask “what do my slides look like, and am I telling a good story?” I so lucky that I get to spend a lot of time thinking about imagery, visual storytelling, and how people react to art or data visualization. I also paint and draw (though I wouldn’t really share those) and I cook. I am actually doing a bread baking experiment this year where I am trying out a different type of bread recipe every weekend. It can be really funny because sometimes, if it has been a really stressful week, I will look for a recipe that really needs to be punched down or kneaded for a long time. It’s a good workout too! And then we have this amazing bread every weekend. It is all about the aesthetics for me – I host dinner parties, bake, have a great garden – all of that is sort of my own creative outlet. 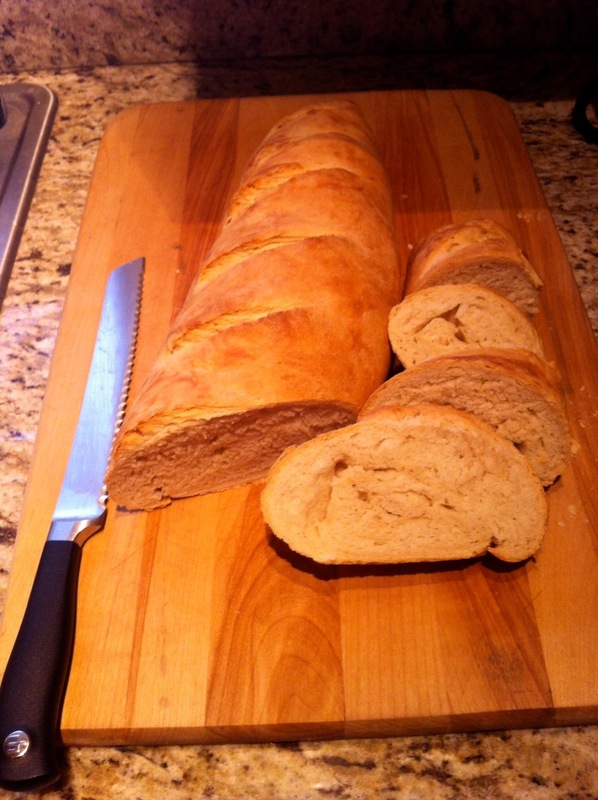 Some experimental results from Liz's bread project. DXS: What is your favorite bread? LN: Oh, the baguette. I made my own for the first time last weekend and it was really fantastic! I realize that baking is one of these things that, if you want to do it properly, you have to be very precise. You should weigh the ingredients. But I’m precise in the rest of my life. When it is the weekend and I am having fun, I kind of love it when the flour is just flying everywhere. As a result, my loaves are a little bit mutated, or just not quite right, but they are delicious! 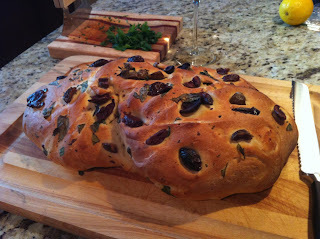 Some of my other favorites also includes a great focaccia (the recipe for it is below!). Yes, absolutely. It’s funny because when you asked the question about my creative outlets that have nothing to do with science, it was not entirely easy to answer. You know, science is who I am – it permeates everything I do. 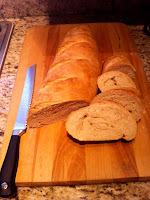 When I am baking the bread, I am thinking about the yeast and fermentation. When I am painting, I am thinking about color theory and visual perception – after all that would have been what my PhD was in! Speaking of color theory, Joanne Manaster recently shared a “how good is your color vision?” quiz. I took that test immediately to see how I would do. That lead me on this interesting exploration around the literature, and I read one theory that Van Gogh might have had a certain type of color blindness. I love this question of how our brains interact with the world. In animal behavior the concept is called “umwelt” - each species has a unique sensory experience of the environment. I like to think about how that applies to individual people to a smaller degree. I think about this all the time – science, creativity, art, aesthetics – it is all one beautiful and amazing thing to me. I accept the fact that, especially when it comes to strangers, we make up stories based on what we see – clothes, hair, etc. I know that this happens to me as well. 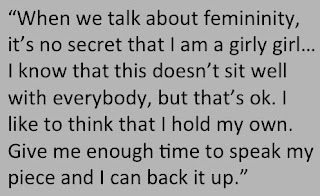 When we talk about femininity, it’s no secret that I am a girly girl. I wear makeup and heels. That’s how I feel most like myself, how I feel best. I know that this doesn’t sit well with everybody, but that’s ok. I like to think that I hold my own. Give me enough time to speak my piece and I can back it up. I’ve got an interesting career, I am a geek, and it is not hard for me to connect with people once we start talking. My graduate advisor was the same way – he acknowledged who I am and didn’t bother about how I dress. We didn’t avoid the topic. It just wasn’t an issue. I hope that other women can have that same experience. It doesn’t matter if you are a tomboy or a girly-girl. I don’t care - I am not judging you. You don’t have to look like me because I am in a dress. 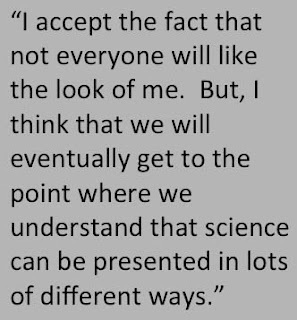 This is why I love this #IAmScience meme, and the whole “be yourself” mentality. And that is what I am going to do. I’ve decided to be myself. I accept the fact that not everyone will like the look of me. But, I think that we will eventually get to the point where we understand that science can be presented in lots of different ways. For me, my job with COMPASS really is sitting at this nexus of asking how we share science with people who aren’t intrinsically fascinated by it or connected to it. This is very much a ripe field for thinking about creative expression. Mostly, we come at it in terms of verbal presentations, storytelling and written materials, but then I specialize in the social media and multimedia components. 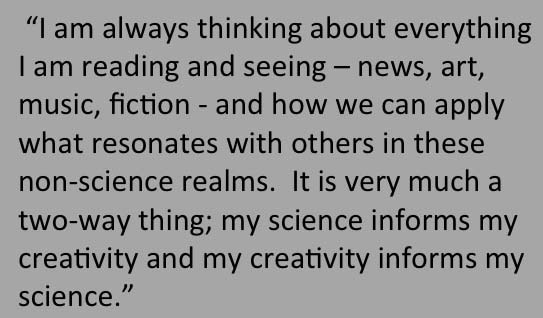 I am always thinking about everything I am reading and seeing – news, art, music, fiction - and how we can apply what resonates with others in these non-science realms. It is very much a two-way thing; my science informs my creativity and my creativity informs my science. That makes it really fulfilling and exciting for me. I see this in terms of the ability to make connections. When I am standing up in front of a group of researchers doing a social media training, I am making pop-culture references, alluding to literary works, quoting song lyrics. When you get it right, you can see someone’s eyes light up. It’s just another way to connect - people sit up and pay attention if you can make a meaningful reference to the artist they love or the book they just read. One of the questions we always use in our trainings is “so what?” So you are telling me about your science, but why should I care? Miles Davis has a famous song “So What?” and we play that in the background. It makes people smile. It makes it memorable. I love that. 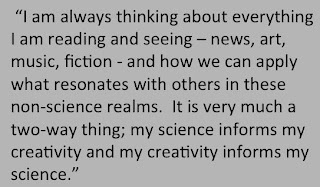 I really like this idea that we should be using the fullness of who we are and our creative selves, including all of the sensory modalities, to talk about the very abstract and difficult scientific topics we care about so much. I feel very comfortable in my own skin, and who I am and where I come from does tend to be a classically feminine look (at least in terms of clothing choices and how I wear my hair). 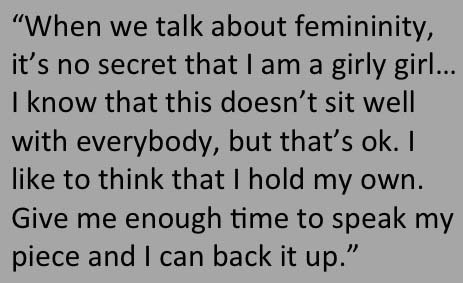 I am never quite certain the exact definition of “femininity”, but I don’t think how I look so much influences people’s perception of me as much as it opens up opportunities for us to discuss gender and personality and science. Part of what I do for my work is to help scientists understand that in journalism, we need characters. So, I have the obligation to walk my talk – we are all the main characters in our own lives and we have to live with that and be true to that. It brings up interesting questions of personality and privacy. I feel pretty comfortable talking about my clothes and my art and my dogs and my bread baking – but I also know that a lot of people don’t want that type of stuff out there. I like the challenge of helping them tell their own science stories and shine through as interesting people in a way that is authentic and represents who they are in a way that works for them. Sure, I think that I sometimes surprise people. For example, in the world of communications and journalism, we are seeing more and more that coding and programming has great value. To just look at me, you might not believe that I geek out over altmetrics and that I miss using MatLab. I think that this sort of willingness to interact is something I try to help the scientists that I work with to understand. Maybe you think that you are going to be met with great opposition toward some subject like climate change, but if you have the willingness to approach it without assuming the worst, it opens new opportunties. I’m no Pollyanna, but I think relentless optimism and a commitment to finding common ground with others is very effective. When I introduce social media to scientists, it has changed a lot over the last three years, but there is still a lot of skepticism and some outright scorn for “all those people online.” I like to encourage taking a step back from that in order to reveal all of the awesome things going on online and the ways you might engage. I truly enjoy the process of turning skeptics into something other than skeptics – I might not change them into believers, but they will at least be surprised and interested onlookers. 1. In a large bowl, combine the flour and salt with 1Ž4 cup of the olive oil, the yeast & the water. Mix with your hands for about 3 minutes. 2. Lightly dust your countertop with flour and knead your dough for 6 minutes. Enjoy your arm workout and stress relief exercise! 3. The dough will be pretty sticky. Put it back in the bowl, cover it with a damp cloth, and let stand at room temperature for 2 hours. 4. Mix 1Ž2 or more of your olives and all the basil into the dough, and try to get them evenly distributed. It won't be perfect, but it will be delicious. 5. Dump the dough onto a lined baking sheet. Flatten it with your hands until it's a big rectangle about 1"/2.5cm thick. Slather with olive oil. Let rise for 1 hour. 7. Sprinkle with flaky sea salt and drizzle with more olive oil if you want. Bake for 25 minutes or until golden. 8. 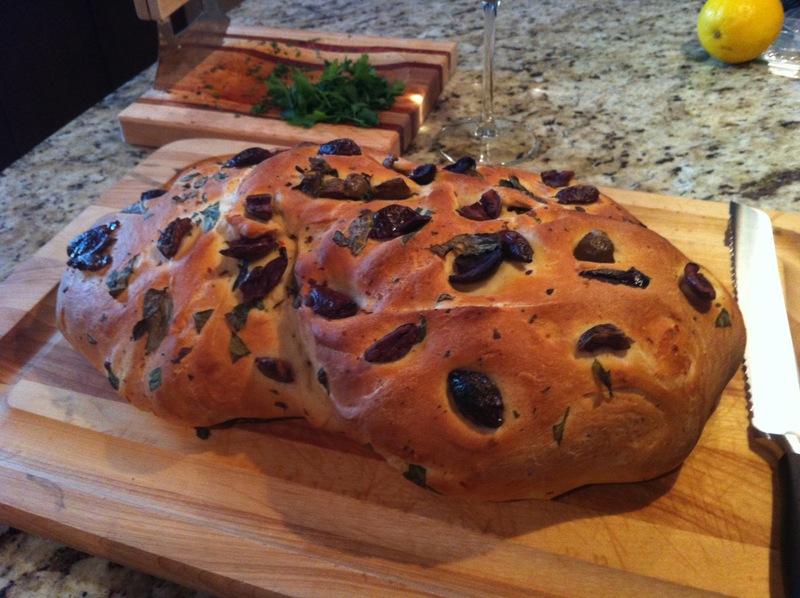 Make your neighbors jealous with the amazing smell of baked bread wafting from your house.